Oh you didn't know there were mermaids in this? Well, here you go. 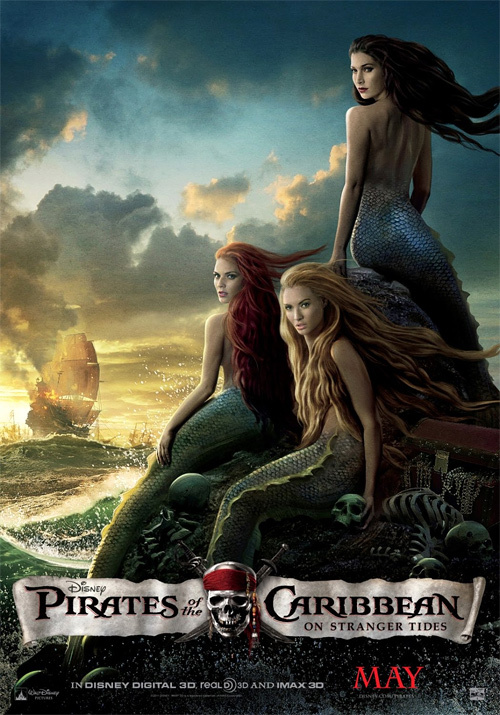 Disney has been releasing a series of character posters for Pirates of the Caribbean: On Stranger Tides (see more here) and, well, they're honestly not that exciting, but this mermaid one (via IMPAwards) I couldn't pass up. Though I'm not sure which one is Astrid Berges-Frisbey? Disney also showed a select 20 minutes of footage (three full scenes) from this at CinemaCon and it looked pretty good, exactly like yet another Pirates movie, but closer in scope to the first one than the overly-epic sequels. The plot is more straightforward, but I'm quite excited to see it. Jack Sparrow (Depp) and Barbossa (Rush) embark on a quest to find the elusive fountain of youth hinted at the end of At World's End, only to learn that Blackbeard (McShane) and his daughter are after it, too. Pirates of the Caribbean: On Stranger Tides is directed by Oscar nominated director Rob Marshall, whose only previous directing credits are Chicago, Memoirs of a Geisha and the musical Nine. The screenplay was once again written by franchise regulars Ted Elliott & Terry Rossio, based on Tim Power's book On Stranger Tides. Disney is bringing Pirates of the Caribbean 4 to theaters in 3D starting on May 20th this summer! I'd hit that, but how? Why are there never any short haired mermaids? to cover their lady lumps of which they have none on this poster? Because long hair is much more feminine and is one of the most important attributes of woman's beauty. Short haired woman CANNOT be beautiful. Emma Watson is the biggest proof. On the other hand Carey Mulligan and Mia Wasikowska are hotties even with short hair. Want mermaids with short hair, Carey and Mia are good starts. I think the reason the ship is in the distance is because the sailors realised they could use whale oil as a lubricant and sacked off the mermaids cause they'd been getting busy with each other. this film should be pretty silly, I'll watch like I watched the rest but I won't be paying a shilling fer it. Yaaahaaar, Pirates indeed. That's why they were casting women without breast implants, I suppose. Diversity rules...blonde, brunette and redhead. Good thing. None of them look like Darryl Hannah from Splash. Bad Thing. Where does the "Mermaid Box" go? The last POTC they make should be called, "POTC: Clean and Sober" where Depp plays Jack totally straight and rehabilitated. It would be a nice inspirational way to end the series. This poster is pretty bad. too much cgi and make up!